My 12th Ironman finish and what I needed to be eligible to apply for the Kona Legacy program by the end of the year, just have to make sure I complete at least one Ironman each to remain eligible until I receive my Kona slot. This race has a lot of history, being one of the oldest at 33 years with the earlier years held in Forster Tuncurry up until the early 2000s. The choice to do this race wasn't an easy one. There was only one direct flight from Brisbane for $200+ per person each way on Fokker planes that could not fit in bikes. So we had to drive. On paper, it should take about 6.5 hours. But with the Pacific Highway upgrade roadworks and the stops we had to take before our toddler son gets too cranky, with each stops have to be at least 30-45 minutes so that he can have a bit of a play, the journey took much longer. 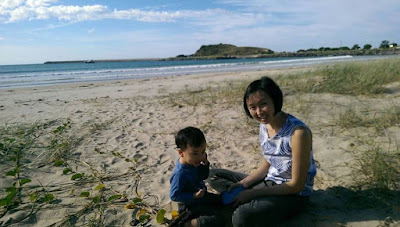 We decided to break the drive, spending the night at Coffs Harbour on the way down and a night at Iluka on the way back. I'm glad we did. I can't thank my wife Li-Ann and son Sebastian enough for enduring this trip with me just so I can indulge in this silly (crazy?) hobby. The other choice was to do Cairns, which I did in the past two years so I wanted something different. Also, I was too afraid to descend down Matthew Flinders hill the last time I did Port 3 years ago and embarrassingly walked down instead (I was probably the only one who walked DOWN rather than UP the hill) plus I had a tubular puncture then that I couldn't fix and waited at the road side for about 45 minutes until I was given a spare wheel, so I wanted a bit of redemption on this course. The training build leading up to this race was short, following the post Christmas/New Year holidays so it does the body and mind to slowly get back into things. I only started seriously into training in early February, so about a 3 months build. I took a different approach this time with a longer 4 week build (instead my usual 3) followed by a week's recovery. 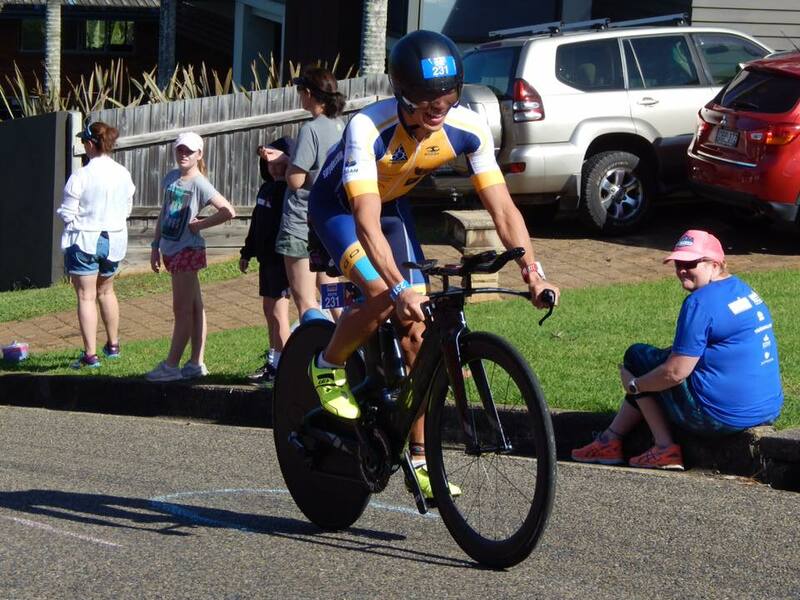 Even in one of the recovery weeks, I slotted in Kingy Olympic tri so although the weekend's volume was reduced, it was high intensity racing. But my body responded well to this new approach and I have to say, that I was feeling fitter than ever leading up to Port. 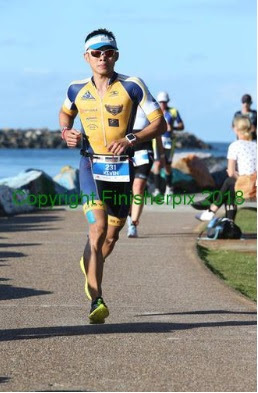 After having been coached in my earlier years of Ironman racing, I'm enjoying the flexibility of doing my own thing now and still holding myself accountable. My weekly hours peaked at just under 13 hours with 7 sessions a week (2x swim, bike, run and 1 gym), I made sure each session counts and no junk miles. I owe it to myself and my family that time spent away from home training was as productive as it can be. Doing the longer miles towards late autumn helps too with the cooler temperature, so I was able to put in some solid sessions and feeling confident. So onto the race, with no scheduled video briefing and welcome dinner (we were given vouchers instead to use at local restaurants) my time spent at the pre race events were minimal which I much prefer. I did a trial descend on Matthew Flinders hill not once but twice and I was relieved that I have conquered my fears, it didn't seem much of a fuss after all but I would be lying if I said I didn't have palpitations when I got to that intersection. Easy 10 minute swim on race morning eve, bike check in and then taking it easy for the rest of the day. Race morning came quickly, I was planning to walk to transition about 15-20 minutes from the motel but our son was already up so we all drove down together. It was a chilly morning but calm with barely any wind. The queue to the portaloos were long but there were plenty of them so we moved pretty quickly. A bit of stretching, put on the wetsuit, kissed Li-Ann and Seb goodbye for about 11 hours or so, and then line up for the rolling start. I was able to get as close to the fastest wave (sub 1 hour swim) as possible. Unlike previous years, the swim start and finish now are at the same location in Westport Park. Previously we had to walk about 500m towards the carpark closer to town and we had a bit of a downstream for a longer portion of the swim. This time it's more equal, in a rectangular shape in anti clockwise direction. While I enjoyed the still waters of Hastings River, I always found it difficult to sight the buoys with the many boats docked around the course. I almost swam into one after the first turn. Other than that I kept pretty close to the buoys. I had plenty of people around me but I did not stick to any specific feet for extended amount of time. Swimming underneath the bridge always freak me out a bit no matter how many times I do it, for fear of crashing into one of the pillars. The weir crossings at the 1.7km and 2.5km were nice breaks and check points to see how I was progressing. I had to be careful though not to trip myself or push anyone over while hurrying up and down the steps. Catching sight of the finishing flags was a bit of relief as I was getting bored of seeing nothing but water. My swim time was 1:03:18 which was a minute slower than the last time I swam this course but still a good swim for me. I have long given up chasing to clock a swim split under the hour and as the years go by, I become less and less of a swimmer (used to swim for club in my teens) so as long as I don't slow down significantly, I am happy. My Garmin recorded 3856m so it was pretty much spot on, pace was 1:39 per 100m, on par with my training splits. 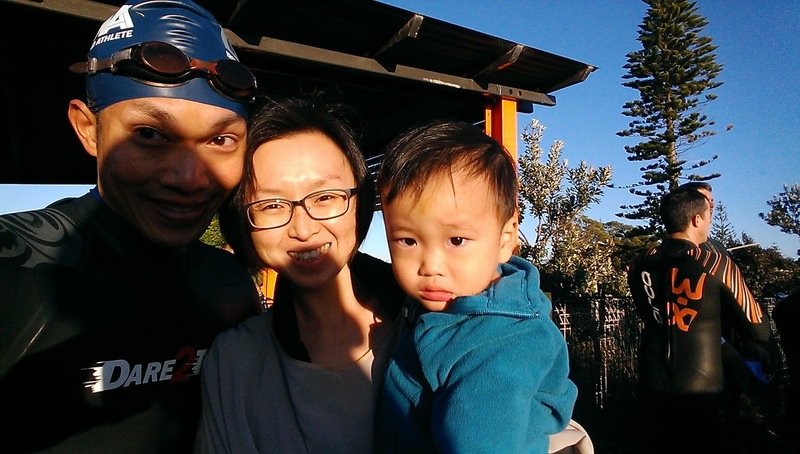 It was great to see Li-Ann and Seb as I was running towards the change tents. 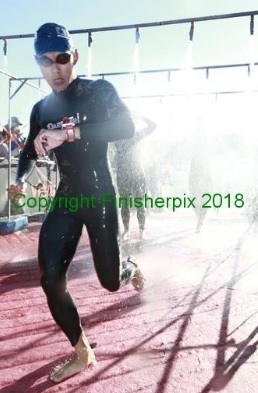 I struggled a bit to find my wetsuit zipper and almost asked Li-Ann for help (could have risked a DQ for outside assistance!) but I found it in the end. Wetsuit came off without any trouble. Wipe down feet, socks on, 4 Clif bars into my pockets and put on helmet on the go. Volunteers in the change tent were great, pulled out all my bike gear and packed away all my swim gear swiftly. I was a bit wobbly trying to fly mount my bike, so I decided to be safe and unclipped one shoe before putting in the other. Time taken 3:11. Bike course is two laps along the coast from Port Macquarie heading south towards Camden Haven with two brief detours before heading back to Port. Roads are decent, not great. The hot mix surface can be rough and slow, it saps the energy out of you if you don't pace yourself well. Some areas can be a bit patchy with a few potholes. But all of this is expected and everyone's doing the same course. A few short steep hills with the infamous Matthew Flinders climb, about 8km before the end of each lap but we descend down this hill first. My Garmin Edge and 920xt recorded 1684m and 1162m elevation respectively, so you be the judge. We were really lucky to have perfect racing weather. Cool temperatures but very sunny. Light winds but it did pick up on the second lap. A bit of headwind on the way out, a bit of tailwind on the way back. It took me a while to get my speed up during the first 10km. There were a few climbs coming out of transition and I was overly cautious on the descends especially with many other cyclists around me. So I didn't gain much speed on the descends either. On the second lap, when the pack thinned out a bit and I was more mentally prepared of the corners ahead, I was more confident. 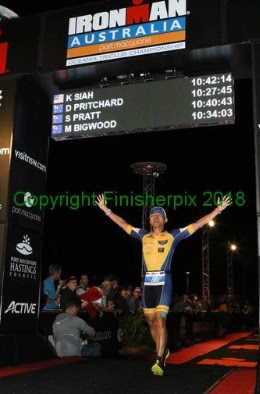 I was still nervous when I first approached the sharp turn on the adjoining road leading into Matthew Flinders, but it was over before I knew it so I definitely did better on the second lap, still relatively slow though. After the descend from Matthew Flinders, there were long stretches of flat roads where I could stay in aero position for extended periods of time, sitting up just to get my drink bottle. I don't have an aero bottle in between my aero bars and this has worked out well as it forces me to sit up every 15-20 minutes or so. I paced myself conservatively, averaging 160 watts, which is 75% FTP for me. Average pace built up to just under 32kph by the end of the first lap but the wheels came off (not literally!) pretty much about 10km after the turnaround. While it was the complete bonk I felt in Busso, the body did feel a lot weaker. I was sitting up a lot more and I was getting more and more uncomfortable being in aero position, absorbing the vibrations from the road traveling from my hands all the way to my lower back. I was still eating well though. I alternated between having an Endura gel and a Clif bar at each aid station, finished 6 gels and 4 bars in total on the course. The weather was cool enough for me to keep to having a drink every 10km. I only had to change swap my bottle once for Isowhey that they provided, it sure has a very strong taste! Lots of people passed me on the second lap but I was still pushing consistently, albeit a bit slow. I decided to take a pee stop at the portaloo at the penalty box just after the 140km mark. It was 97 seconds well spent and I did feel a lot more comfortable after. Rolled on and soon it was the final big climb at Matthew Flinders, the crowds were amazing (no Elvis this year though)! 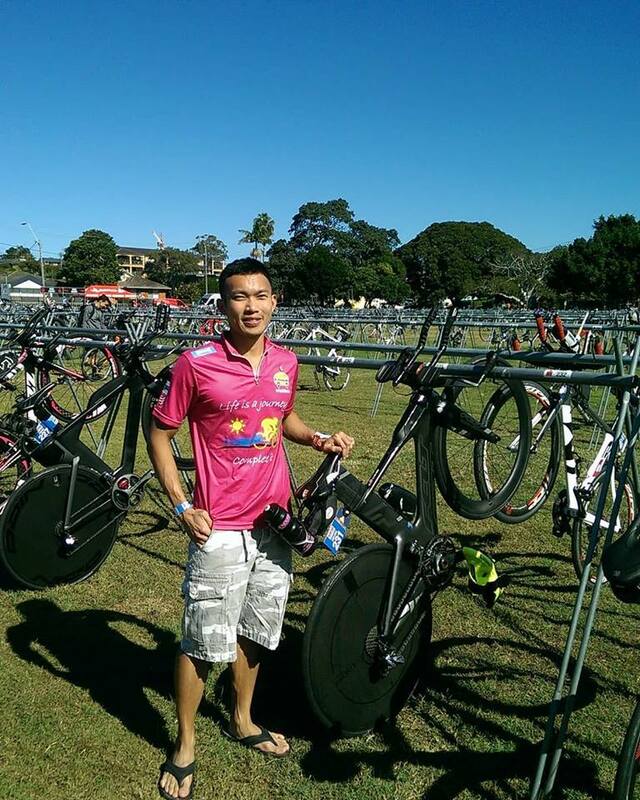 Finally got back to transition with a 5:52:54 bike split, averaging just over 30kph. Average power dropped down to just under 150 watts. 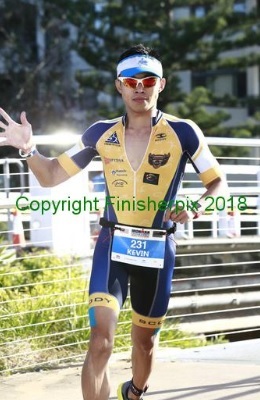 Having done a short course race few weeks earlier, I wanted to run back to my bike rack even though I've handed my bike to the volunteers and I almost did! Luckily I was redirected to run straight towards the change tent. Again, volunteers were great. Unpacked my run gear and packed away my bike gear quickly. My movements weren't as quick as I would have liked but what's a few seconds lost. Socks off, new socks on, shoes on, belt on, sunglasses and visor on the go. Time taken 1:50. Run course is 4 laps starting from transition, head east for about 2kms and turnaround before heading back past transition towards north past Settlement City. There's a gradual climb, which is part of the bike course just before the first turnaround but it moves quickly into downhill after that as well. Just have to grit your teeth and power up the climb and use the momentum to roll down the slope after. If there's something I would pick Port over the other races is the crowd support. You get more of that on the bike course and you get a whole lot more of that on the run course. There were no quiet zones that you had to dig deep on your own. Throughout the whole run course I felt being lifted by the crowd. My legs seemed as though they turned on a switch the moment the run course started. Although I had to stop a couple of times at first to adjust the tongue of my shoes, they were powering through the first few kms. For the first lap I was clocking 4:30 to 4:45 per km. 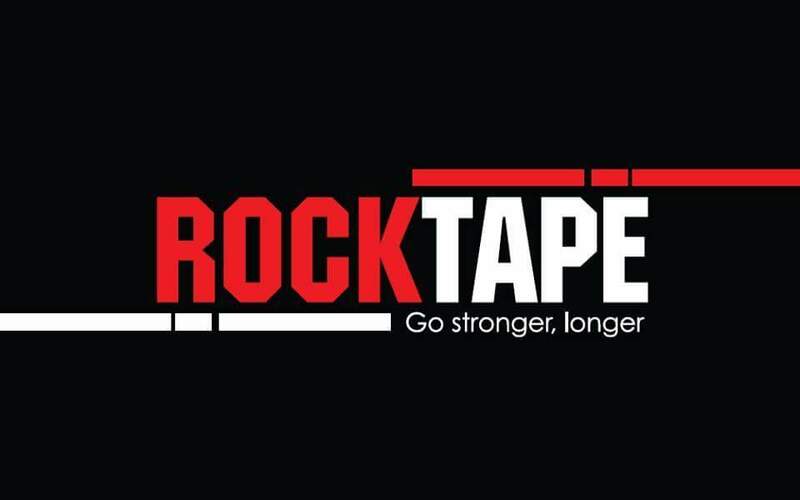 The long brick runs in my last two training weekends (20km and 15km respectively) definitely helped. Next lap I slowed down a bit to 4:45 to 5:00 per km but I wasn't too worried as it was expected. 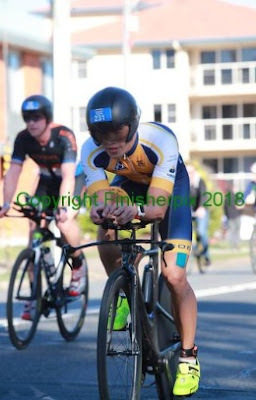 I was keen to catch my friend Nathan who passed me on the second lap of the bike and was about 15 minutes or so ahead when we started the run. I managed to pass him on the second lap and he encouraged me to push on. 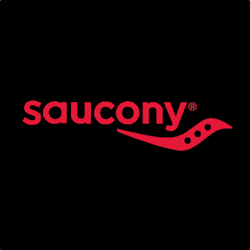 It's nice to do the same race as friends and club members, seeing them out on the course - Greg Z, Anthony, Shane, Philippe, Mel, Afrar, Trev, Ross, Greg S gives you more motivation. Supporting club members Helene and Brad and many others were great too, giving us the extra boost! I placed 35th in my age group and 149th overall. 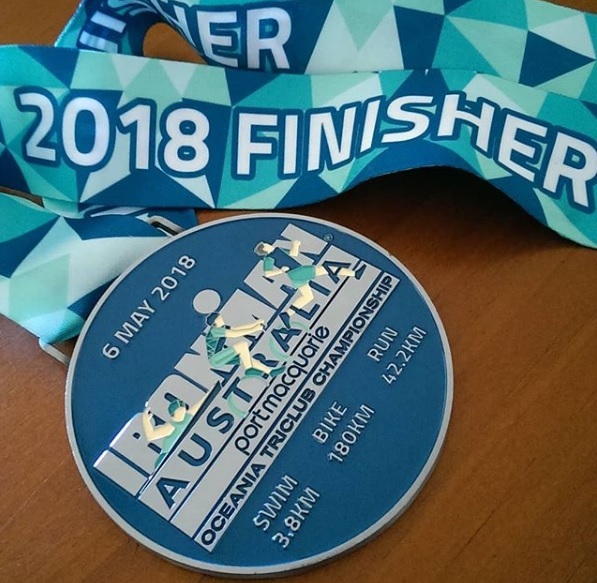 While the finish time was a bit slower than I hoped, given that I was training well leading into this race and expected more, it was a finish that I needed and that's good enough. Coming in under 11 hours is still pretty decent in my books. There are many who helped me through this journey but top credits obviously goes to Li-Ann and Sebastian who made lots of sacrifices for me to get here. 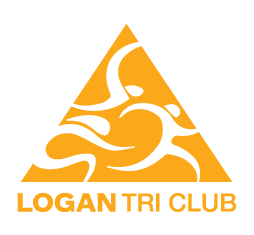 Logan Tri Club has been a great support network inside and outside training and on the race course as well. Mum and dad, and my siblings and brother in law, tracking me online and sending me well wishes leading up to the race, it's always a nice feeling that they are sending me love and keeping me safe even from so far away. And to everyone else sending me positive vibes through social network, thank you as they definitely kept me going when the going got tough. Now for a bit of reduced (note not zero) training during the off season before building up again to Ironman Malaysia in November! Fun, fun, fun! Triathlete by dawn... Accountant by day... Husband & father by night. This blog is dedicated to my passion, triathlons... my love, my wife & son... and occasionally my work and other things I do here in Brisbane, Australia. ...When the Night is Cold, only the Rainbow will rise..
Xterra Malaysia 2014 - Oops! What is the Malaysian identity? Introducing my Ceepo Katana, aka King Arthur! 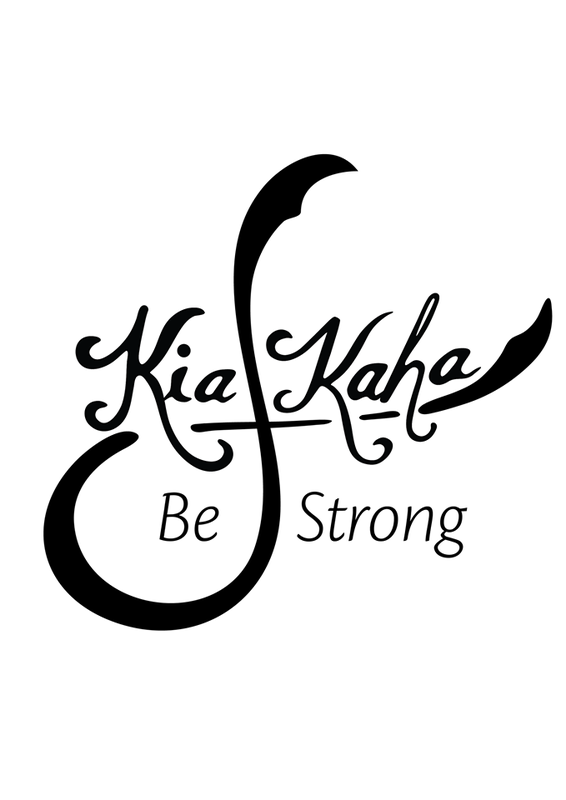 Kia Kaha | "I am a woman, watch me score." Benvenuto al paradise del Lydia!! Will You Please Line Up?